Dieng plateau Wonosobo – Still with the charm of Dieng, not only as a beautiful mountainous landscape with trees and fields lush expanse. 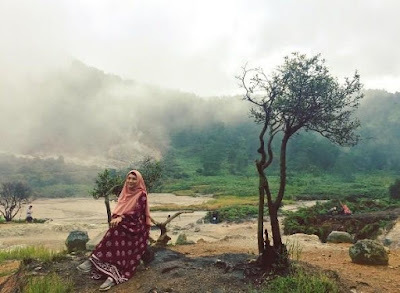 Though the mountains, Dieng has a charm that never suspected before, where there are volcanic craters in the Dieng active. The crater is not just in one location, but location 3. 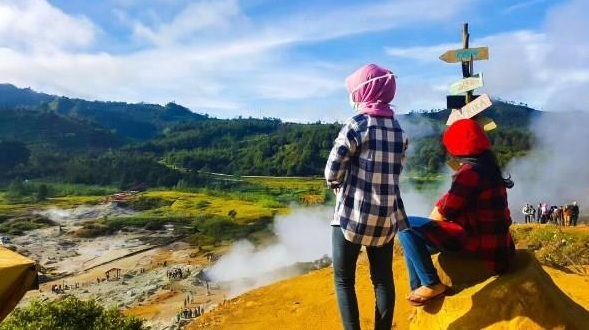 Dieng plateau tour Banjarnegara in the list that should be visited. Despite its location in Banjarnegara district but people knew him as Dieng plateau Wonosobo. Dieng plateau which until now still active is Sikidang crater, Sileri Crater and craters Held. Sikidang crater crater is one whose existence is still active with a sulphur content which is still high. This crater is located in the village of Dieng Kulon Subdistrict, Batur, Banjarnegara district. Location of Sikidang crater is adjacent to the temple complex of Candi Arjuna and Bhima. If you visit this place will get a view of the white expanse of land along the crater area is surrounded by green scenery and farming community. Active mud for a pool, the Manager gave a bamboo fence that makes the border to visitors so as not too close to the crater, because the smoke is toxic. Here the land was barren and there are no trees because all dead due to activity in the crater. 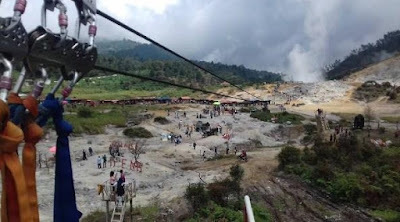 In a certain point there is a former pit crater, there is a pool of some of them are still warm with the breach raises froth-land biuh that seeps through fissures accompanied by deposits of sulfur. The unique Sikidang crater is from the breach the crater that will be moving from one place to another place which is average for 4 years but still in the same area, the same thing with the character kidang (deer in Javanese language) who likes to jump here and there. Therefore this crater called Sikidang crater. Due to the high level of sufur and their toxicity, visitors are expected to wear masks and not throw lit cigarettes or is punting. Because it was feared could trigger an explosion so fire occur. These advisories please visit followed by anyone, for the sake of safety. To reach the location of the parking structure, must walk down the cliff sloping towards the West by crossing the land of dry white. Must be careful, skip the dry ground because if wrong, the land could be amblong and fell into the crater. To enter this tour visitors are charged Rp 10,000.00 for domestic travelers and IDR 25,000.00 to foreign tourists, which includes admission to the temple Candi Arjuna and Bhima. It can be said that this ticket is a ticket sign-on, it greatly facilitates because once pay can already sign in three tourist sites at once. If it does not pass through the temple Bhima then have to pay IDR 7,500.00 for domestic tourists and Rp 15,000.00 to foreign tourists. Open from 7.00 16.00 GMT. Here featuring the natural beauty, visitors can also rent a horse to go down into the crater or to take pictures. There is also an OWL, a rented photographers, even citizens who sold chunks of sulfur which souvenirs there. Which is now a favorite stall with a poached egg is sulfur, which here we can Cook eggs are directly incorporated into the crater with a wait time of 5 minutes we can already get the eggs cooked. Unique, isn't it? There are two versions of the origin of Sikidang crater, scientific and mystical. Scientifically, Sikidang crater occurs due to volcanic eruptions which ejects many years ago a volcanic mud explodes-letup accompanied toxic gas and form a thick white smoke which is now called Sikidang crater. According to folklore, in ancient times there lived a Queen who is waiting for the beautiful Queen named Tata, her beauty is very famous and not so that many youth who tried to approach him. One day there was a King of the Milky mandraguna, filthy rich, and high, Raja Kidang Garungan intending to proposes to the Queen. Hear that, Ratupun was pleased because the King of the Galaxy and rich. Then came the Queen of the Palace to see the King. He saw the King from the bottom upwards, until the Queen's surprise at the sight of the King's head turns intangible Kidang. He was very disappointed but on the other hand is afraid to refuse applications due to the divine power of Kings. Before the Queen replied to the King's proposal finally Queen proposed a requirement when it could make well in front of the Queen and his troops then application will be accepted. Disanggupilan, with accounts of the King began to dig wells in quickly, and it was also the Queen and King to hoard his army he could not get out. All kinds of ways the King do to exit, with the accounts of King made the Earth tremble and awesome explosion inevitable until making a crater. Although the King could not also out because such wells in all, do not despair, the King was moved to another place and try it multiple times with different locations but never get out. Because it is very disappointed and angry, with accounts of his the curse of the that all descendants of Queen will be dreadlocked. That is how the proposition of asala Sikidang crater, and that is why many children in the area around the crater or Dieng still dreadlocked. And did you know? That to cut the dreadlocks are there have to go through the ritual of first because every child dreads will be honoured or respected by citizens, believed to be the descendants of Queen Tata. Sileri crater is located in the village of Kepakisan, district of Batur, Banjarnegara district. Among the other crater, Sileri Crater is the most active crater and the largest with an area of 4 Ha located on the slopes of Mount Pagergedang. Because the Sileri Crater activeness, recorded ever several times erupted. Because of this, the crater is the crater is dangerous with its continued support of white smoke and volcanic symptom. Nevertheless there are very beautiful scenery and the warmth of the steam will refresh your body. As well as the beauty of the crater of water flows into the river just next door is used for irrigating the fields around. Surrounded by towering green hills with neat farms Sileri Crater add to the beauty. The shape of this crater is kepunden or flow from high places a lower place. Fitting time to visit when in the morning, where steam is still stuck in the water and then taken up by itself, a view that is rarely seen. To enter the location of both domestic as well as foreign tourists have to pay Rp 5,000.00. 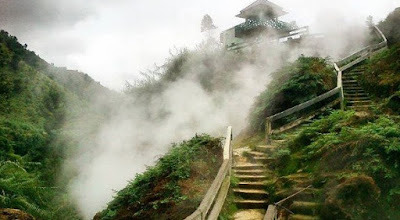 And to reach the location of the visitors have to walk down the stairs of concrete of about 300 m. If you from Dieng, it takes approximately 15 minutes to reach the location with a mileage of 7 km. Sileri Name itself comes from the word leri or water washing rice, because of the color of the water in the same crater with water color wash rice then the crater named Sileri Crater with the title. The crater would have been Held already no stranger ear we, the crater that is located in the village of Pekasiran, district of Batur, Banjarnegara Regency is indeed the same as the name of a place in the story of the puppet. It is told that the crater was once enter a baby named a newborn Baby Tetuko (which is now known as Glass Gatut) diair boil continuously. After a long time the baby was appointed who was then brought to the interface and then gembleng by masters of Anga Jali. So created Gatut Glass as we know it today, muscle bone iron wire. 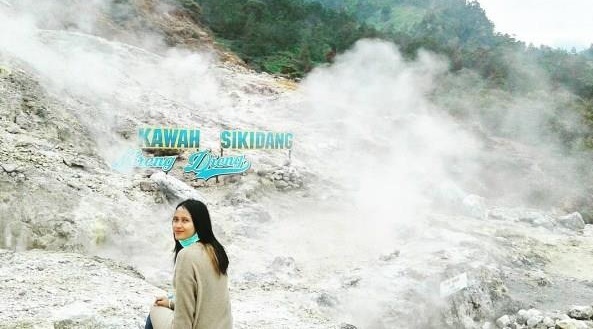 According to interviews Ki Dalang, hot lava in the crater 7 times from the heat of the fire. It is the result of research that says that the temperature in the crater Held could reach 100 degrees Celsius. This crater is not a volcano but is active soil fissures containing solfatra. 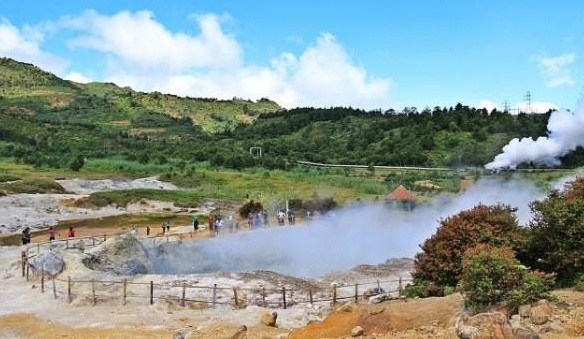 To reach this location from the Dieng Plateau takes 20 minutes by mileage 8 km. to enter the site, visitors are required to pay Rp 5,000.00. In addition to the area of the Dieng plateau in Wonosobo, there is also a source of water that is used as the main source of HYDROPOWER. 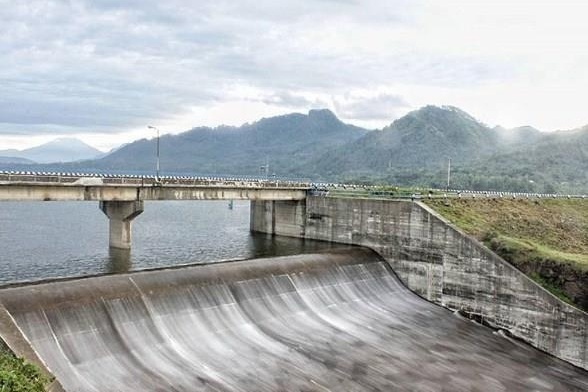 That tour is Wadaslintang Reservoir, as the name suggests, this reservoir is located in the Wadaslintang Sub-district, Wonosobo Regency. This reservoir can be alternative for those of you who love fishing because the fish ponds did exist here. When the dry season arrives the water will recede and some places in this site dries up, along the side of the reservoir will be seen carving beautiful nature in the form of a hollow white wadas and known as the holes are present, or Erorejo. This tour became part of the Wadaslintang Reservoir tourism. If a Banner ad appears from our sponsors please visit as a donation to us, to support the interests of the website is to continue growing in the future thank you.